Magic Mesh is an innovative new kind of screen door you can hang up and then easily walk through – in or out – and it automatically closes behind you. Perfect for your family members who don’t always close the door behind themselves – cats, dogs, and teens. The screen door is actually made of two sections that join together using eighteen magnets that attract to each other and then attach to close the two sides of the door back together so bugs can’t get through. You can easily just walk right through a Magic Mesh screen door, because the two sides separate as easily as they come together. Magic Mesh installs in seconds. The MagicMesh is extremely easy to install. It does not require any tools at all. There are no screws or nails to mar your doorways. 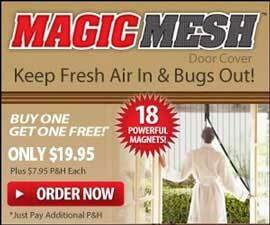 Simply stick the Magic Mesh with magnet to your doorway. The bugs will now stay out while the fresh evening air comes in. It is ideal for use whether your doors are single or whether they are sliding doors. Magic Mesh door cover instantly opens and magically snaps closed behind you using 18 strategically placed magnets. Whether you have your hands full or a forgetful family member you can still let fresh air in and keep those bugs out. The Magic Mesh door is very light in weight and it has a very fine mesh that can keep all insects out. It can be removed easily when you do not need it. The mesh is very durable and will last a long time. You will really enjoy the convenience of not having to pull the door shut behind you. Your children will also enjoy it because they will no longer have to close the door each time they step out. The Magic Mesh is ideal for any home in the summer and you will find many uses for it. If any material object can be called magical, then the Magic Mesh qualifies for this term. It is a light screen that can be attached to any door way.